The schedule for the second round of the playoffs has been finalized. UNB will host Games 1 and 2 on Sunday and Monday, March 1st and 2nd. The series will then shift to Acadia for game 3 on Thursday, and game 4 (if necessary) on Friday. Game 5 would be played back at the Aitken Centre on Monday, March 9 (if necessary). All games start at 7 PM. Also, we'll pass on any details on the fanbus to Acadia as they become available. For fun, we've decided to dish out some virtual hardware to recognize the efforts of the players this season. And since we're only counting the regular season, we're not going to wait until the end of the playoffs to announce our picks. Top Forward: Hunter Tremblay. A lot of people thought he'd drop off after Hennigar left. For the second year in a row he put up 50 pts. He lead the team in +/-, was on the #1 power-play unit, killed penalties, drew the attention of the other teams' top shut-down guys, and still produced. He's also not one to avoid getting his hands dirty, taking big hits to make plays and dishing them out whenever he can, too. Not bad for a 2nd year player. Top Defenceman: Dustin Friesen. He lead UNB defencemen in points, goals, and plus/minus (8 goals, 12 assists, 20 pts, +28) and lead the team in game winning goals. He was a stabilizing presence on the blueline in every game, and set the new UNB Ironman record for games played by a skater at 137. Oh, he also took 28 ceremonial face-offs for the team. Top Goaltender: It was a split decision, but we'll give the nod to Travis Fullerton, who after a shaky start and limited action in the first half put up stellar numbers in the 2nd half of the season. He only played 13 games which might not be enough for official AUS statistic recognition, but he would have led the conference in Goals Against, Save Percentage, and Shut-outs (GAA 1.80, Save% .914, SO 3). He tied a team record for 3 complete shut-out games (3, Reg Bourcier), set a record for shut-out minutes 292 minutes and 39 seconds, and may have set some AUS and CIS records too, though those stats aren't available. Most Improved Player: Kevin Henderson. Henderson came to UNB last season and found duty on the 3rd line in more of a checking role. He put up a respectable 15 pts, but a lot of fans thought he was capable of doing more. This season several early injuries gave him the opportunity to play on the top line with Cuddihy and Tremblay, and he certainly made the most of it, leading the team in goals scored (19) and tied for the lead in points (50) with Hunter Tremblay. Hardest Hitter: Chris Hodgson. Ask Boston College's Nick Petricki. Honourable mention to Jonathan Harty. Rookie of the Year: Bretton Stamler. The rookie defenceman was solid in his own end, chipped-in 13 pts, was +20, and contributed a rare AUS fight. This was a close one, there were 3 runners-up, and Stamler got 2 votes. Top Defensive Forward: John-Scott Dickson. We give him the nod over Hunter Tremblay on account of his relentless penalty kill efforts and unmatched shot-blocking skills. There were some nights where the shot count was low and Dickson made as many saves as the UNB goaltender. Fan Favorite Award: Chris Hodgson. It's been awhile since UNB had an overwhelming physical presence in the forward ranks. Nothing generated cheers quite so much as when Hodgson would leave opposing forward's carcasses in a crumpled mass after a big hit along the boards. Judging by the way his teammates cheered when he scored a goal, we're guessing he's a favorite in the dressing room too. He showed a lot of improvement over last season, and his energy will be needed in the playoffs. Unsung Hero Award: We're giving this one to Josh Hepditch. It must be hard as a veteran player to fight for ice-time on a team loaded with good players. It's probably even harder when you don't know what position you're playing some nights. Hepditch saw time as both a forward and defenceman this season, doing whatever he was asked to do. He's good enough to be starter every night on any other team in this league, but had no problem doing what was best for the team, even if that came at the expense of his own ice-time. Thanks Josh! Runner-up: Kyle Bailey. The playoffs officially start this Wednesday night, but UNB fans will have to wait another week until at least the 25th of February for their first post-season action. Hopefully that gives the team time to recover after a brutal stretch that saw them play 17 games in 6 weeks. Great for hockey fans, bad for hockey teams. - UNB led the AUS in shots and shots per game at 1107 shots and 39.54 shots/game. - UNB took the fewest number of penalties in the AUS this season (though had slightly more PIM’s than Acadia). The penalty kill is probably the one area we'd like to see the team tighten up on. Thankfully they seemed to find their power-play again vs. Moncton the other night after a stretch of a few games where they couldn't buy a goal. As they say, it's better to get those out of the way with in the regular season before the games really start to matter. Any other glaring statistics that stand out to you? Let us know by posting a comment. We were never comfortable with differential equations and calculus as students at UNB. Lucky for us, AUS mathematics isn't as hard. UNB needs a single point to clinch first place in the AUS, and that ever-so-important top seed in the 2nd round of the playoffs. It's still early, but with the OT loss last night, SMU has 37 pts, 4 back of the Reds, and 4 up on Moncton. It's looking more and more like SMU will finish #2 and Moncton #3, meaning UNB will face the lowest-placed team in the 2nd round of the AUS playoffs (and likely avoid both SMU and UdeM). Speaking of X, they've been looking like the feisty teams of old the last few games. 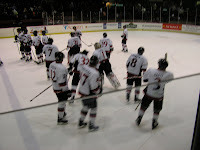 Remember the dramatics at the end of the game vs UNB last week? That had nothing on the sparks that were flying in Halifax earlier this week when 45 minutes in penalties were given out in the 3rd period. X was inactive last night, which is probably good for them considering they had 5 forwards missing from the lineup vs SMU on Wednesday. They'll be ready tonight, and it looks like they're already playing "playoff hockey". The CIS released its weekly Top 10 Rankings. UNB stays at #2 following the loss at SMU and win at StFX this past weekend. They were probably helped by the fact that both Alberta and UQTR lost a game this weekend as well. Alberta lost to Regina, and UQTR was upset by McGill. Interestingly, 1 voter had UNB ranked #1, the other 8 voters went with Alberta. The biggest gainers of the week were Saint Mary's, moving up to #5 after their big win over UNB. StFX was bumped out of the top 10 after losing to UNB, so only 3 AUS teams made the cut this week.